in ALL caps: Why not "In Puddles"? 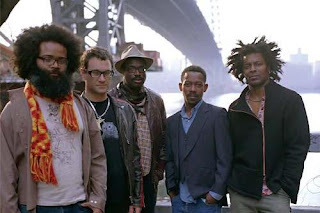 Last week, TV on the Radio released their fourth album and titled it "Dear Science." Am I being just too much of a nerd if I ask why they didn't pick back up on Radiohead references? OK, I digress. A bit of history for you first. Tunde Adebimpe and David Andrew Sitek are some of the biggest musical geniuses of the decade, and it's possible you've never heard of them. If you collect remixes, you may have heard one of Sitek's: Nine Inch Nails' Survivalism is a favorite. Five years later and a few extra bandmates later, their second album "Return to Cookie Mountain" was given the label "Album of the Year" by SPIN Magazine. This album featured guest appearances from such names as David Bowie and Nick Zinner from the Yeah Yeah Yeahs. Influences from Sitek's friendship with Bowie and the band's loose, improvisational style are still true on the current album. "cut the record into pieces, and then send maybe 15-30 seconds of music to a different filmmaker, like all over the world, and then have them send back it back in, without seeing what the other person was making, and then make... an hour long movie... like The Wall for people with attention deficit disorder"
The tracks on "Dear Science" are so smart. They are multi-layered, but not too heavily. There are some deep themes and smart lyrics. It's beautiful how open to interpretation TVOTR allows their music to be, and the songs are so rich with sound that you feel like you've been given a gift with each listen.